Travel jar money – The contents of this must strictly be used for adventures, only. I don’t really publish a lot of (well, any) money saving tips on this blog (if you’re interested in that kind of thing, here are some tips for saving money to travel that are worth checking out!). Yet, I discovered a little gem last year that ended up saving me a tonne of pounds that I could use on travelling, a fancy meal, a new pair of shoes – essentially anything I wanted. Having always been a fairly good saver at home in Australia, I was quite concerned (or, alarmed) at how much money I was going through in London. In an effort to curtail my reckless spending on travel, I decided to allocate myself a wad of cash each week. This would cover groceries, meals I ate out and about, drinks at the pub, etc. Let’s say I’d allocate £100 to this cause each week. I DON’T REMEMBER THE SPECIFICS OF IT. 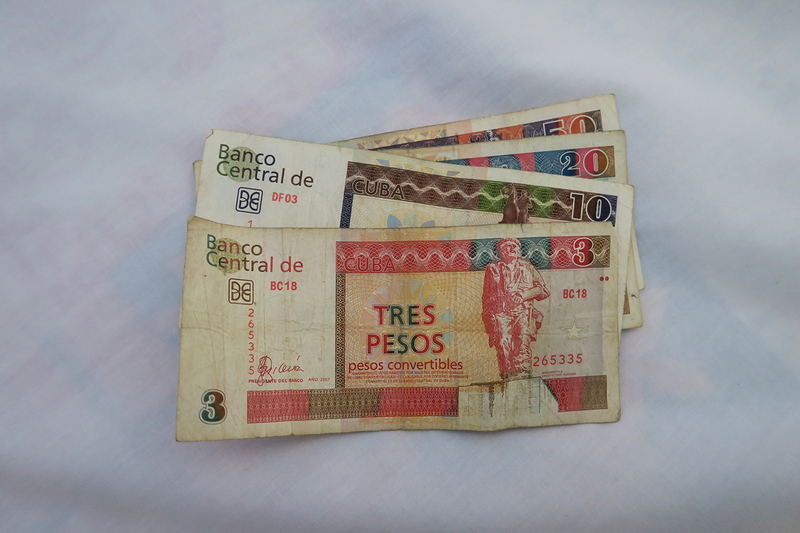 Spending it up big in Cuba. At the end of the week, I’d roll over whatever I had left over into the next week’s funds, so this all worked fine. The problem was, I was accumulating stacks of coins, which became quite cumbersome to carry around town. Particularly the thick and heavy one and two pound coins. We had a big, empty mayonnaise jar sitting on the kitchen counter, so one day I grabbed that and started putting my spare change into it. And that was all of my spare change. Not just my pennies, five and ten pence coins. 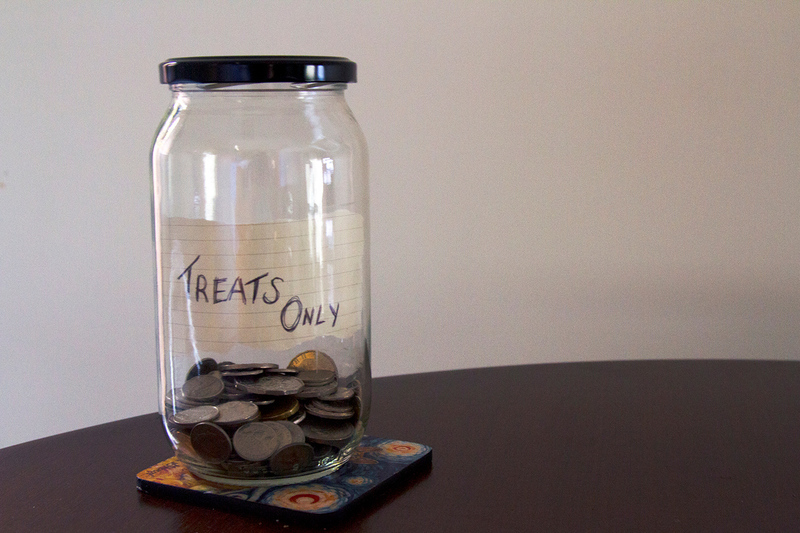 Any change that I’d accumulated over the course of the day went into the jar. In a couple of months, the jar filled to the brim. So, I took it to my local Metrobank branch. They’re a bank chain in the UK, who have money-sorting machines, available to the public. I tossed my coins into the machine, which made some concerning noises and then spat out a receipt. I grabbed the slip of paper, looked it over and gasped. Over the course of those few weeks, I managed to put aside £199.50. I was free to spend this on whatever I wanted. So, I took my boyfriend on an all expenses paid day trip to Brighton and made him accompany me to a zero waste restaurant I’d been wanting to try there. The leftover money I spent on a ticket to see Groundhog Day: The Musical a few weeks later at the Old Vic. 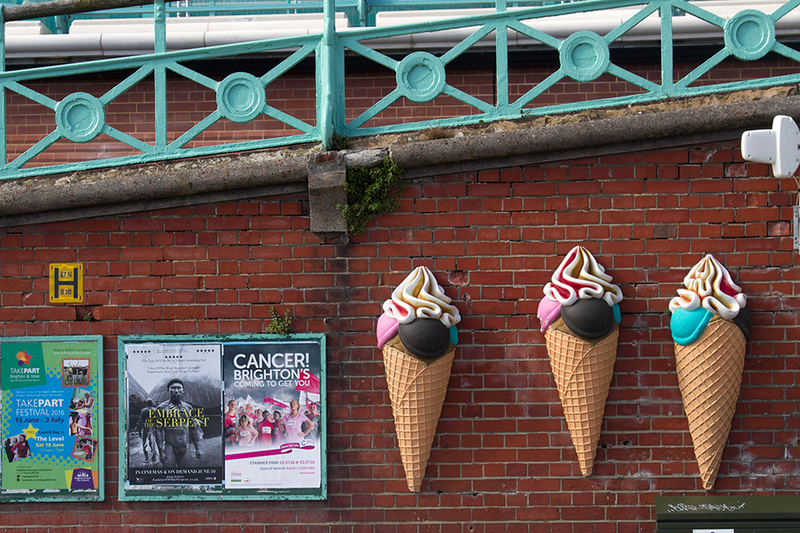 Much ice cream was consumed in Brighton. The next time I filled my jar, I took my fella’s along with me and pooled it. Despite the fact that he had socked away more silver coins than gold, we had over 400 quid. We went to a Michelin Star restaurant and had a lovely evening (also, lol at my past attempts to blog about food… will never be a food blogger, that’s for sure). What I like most about this method of saving, is that you don’t notice it at all. I used to get very excited about growing my savings account (something I’m hoping to get back into, soon) but the temptation to spend the money was always there. So – do make sure you do spend it on something lovely! Use it to fund an adventure you were rather keen to take, but couldn’t quite justify the cost of. And if you’re looking for more ways to save some cash, check out these budget travel resources. Do you have any kooky money saving techniques that you swear by? Great tip here for saving money. I know friends who use this method as well. It definitely works wonders. Also love Metro bank. You know it won’t charge you for any transactions in the whole EU. Worth joining if you are going traveling across the continent. Thanks James. The lack of fees in the EU was why I initially joined them and then fell in love with their coin sorting machines from there! Wish the other banks in the UK were more like them. when someone tells me they have no money to travel I say “get a jar” I’ll prove you wrong! That’s amazing! Yes it’s such an easy method of saving. Outta mind, outta sight and you’re laughing all the way to the bank. I thought I already commented on this? Apparently not! I have one of those tins (only £1 in the Pound Shop – bargain) that you have to open with a tin opener when it’s full and can’t reseal. I get one every year for Christmas but it never lasts past January. The idea this year was to put all my restaurant tips in there and come December hopefully will have enough put aside for a nice little trip somewhere! The problem is I’ve already put about £40 worth of pound coins in, and those will become obsolete in October! So I’ll have to open 3 months earlier than planned. I’m hesitant to chuck all my spare change in at the end of the day like you did because, as bloody great as it sounds, then I’d have to constantly pay for my bus ticket with notes and all the bus drivers will want to kill me! Ah yeah, I like the jar for that reason, as you can dip into it when needed… I pull out $1 coins all the time for the laundromat. But then the whole point of those tins are to prevent one from dipping in! Didn’t know the old pounds were being phased out! Should have kept one as a momentum. Also didn’t think of the problem of paying for transport! Although I haven’t lived anywhere where coins have been accepted on buses since 2010… and I drove everywhere then anyway, as public transport in regional Australia is pretty much non-existent! We had a 5 year plan to quit our jobs in Los Angeles, sell all our stuff and travel. So we bought a glass water bottle (it was an old glass sparkletts water fountain bottle – about 2 foot high) from a flea market .. and kept it by our front door. So each night we came in, no matter what money was in our pockets we emptied it out into this bottle. Not just change, but notes too. Walking out of the house each morning, we saw our funds growing and our dream getting closer. We never did manage to fill that jar, but we had such fun emptying it out counting the notes and taking bags of money to the supermarket to cash in the coins. The psychology of watching those funds grow was inspiring, and a big part of planning for our departure. My family has been saving coins in an old peanut butter jar for several years. This has been our gelato money for our upcoming trip to Italy. It became full about a month ago, so we finally rolled the coins (our bank, unfortunately, does not have one of those sorting machines). Our total was $90 US, which is not a lot of money, but still more than we thought it would be. We are a family of five, so we will probably have to supplement this amount in order to purchase two weeks worth of gelato, ?. Ha! I’m sure that gelato will end up tasting extra sweet. Hope you have a great holiday. I had a great time reading LC. Nothing like “finding” money out of nowhere! Those coins will really add up in the long run. I am so glad that you spent in something fancy. It will just be a total bore if you said you decided to save it again. Great read, very light and very relatable. Hello Ralph! I agree – it would be a total bore to just chuck it straight into the old savings account. This sort of money deserves to be spent on something that is going to add a little fun to your life. Thanks for your comment. Travel and treats, I like it. I see other travel bloggers who will save every penny to travel as much as possible, but I’m not exactly like that. I also love to eat out or buy some pricey health food (food is my weakness when it comes to spending!). I think I might give this method a go. Way to purge those annoying cent coins! Yeah exactly, why sacrifice all the things that bring you joy (lazy brunches, big meals out with loved ones, wine, etc) for some end goal? Life is for living, yo.